With over 10 years of professional experience, Dean Durrant Design in Melbourne is your water feature specialist. Each water feature we create is custom designed and made to suit the individual client, and we are pleased to be able to offer clients the complete package of design, manufacture, installation and maintenance of water features. Our water features, which are made from solid granite, always complement their surrounds, as they aren’t pre-fabricated and imported in set sizes. We have found natural stone to be not only a perfect match for water in creating stunning water features, but also a long-lasting and enduring material that will keep its appeal for many years to come. In addition to being a fantastic medium for water, solid granite is raw, natural, looks great, easily cleaned and never fades or cracks, unlike water features that are made from cast concrete or fibreglass. 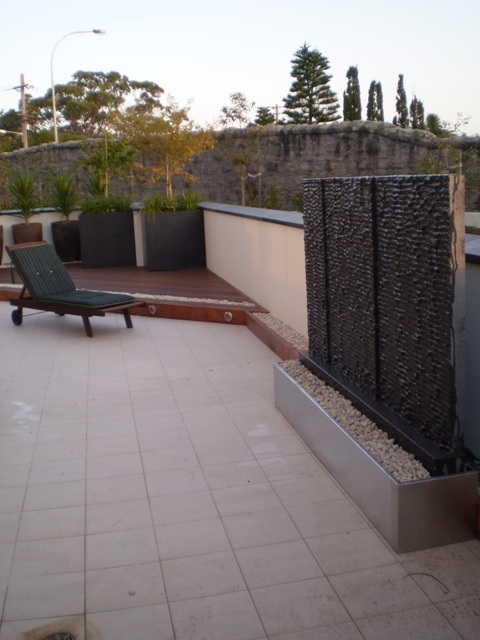 As specialists in water features, water walls are among the most popular installations that we do. Many of the water walls that we create are freestanding and made from 35mm solid panels that can be mixed and matched according to the client’s requirements. To further assist our clients and for their convenience, we provide free onsite quotes and drawings to help give a better picture as to what can be achieved. Because the stone we use is sourced both locally and overseas, and can be cut and shaped to suit, we are able to fully customise each and every water wall in terms of colour, texture and size. Good water features should have minimal splash, utilise simple mechanics and water flow design, be freestanding, give even and full coverage of water over the face of the feature, be textured to provide visual movement and the sound of water, and be easily maintained and cleaned. Having created hundreds of water features throughout Melbourne and Australia, it is a pleasure to be able to share some of our installations with you. Have a browse to get an idea of what can be achieved, or be inspired to come up with your very own unique design. Each water feature we create is professionally made to order, and sizes can be easily changed. The trough for each is also made to size, and can be finished in stone, fibreglass, timber or stainless steel. Click to browse current designs and pricings of water features that are for sale. Prices include water feature, trough, pump, lighting, pebbles, delivery and installation in Melbourne and within Victoria (for interstate orders, please contact for pricing). Dean Durrant Design services all locations across Melbourne when it comes to our water features. Popular areas where we have created water features include Docklands and Toorak.